This meeting digs into the qualifications and responsibilities of an Elder and our CCC structure and governance. This class is open to anyone interested in learning more about these topics -- not only those pursuing to become an Elder. Additionally, this meeting is intended as a prerequisite for all prospective 2019 Elder nominees. A light lunch is provided. There is no childcare available. Looking to nominate someone as an elder? Email . 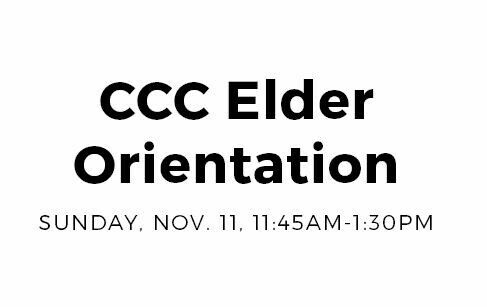 Interested in learning more about what the CCC Elder qualifications are? Download the Qualifications file here!